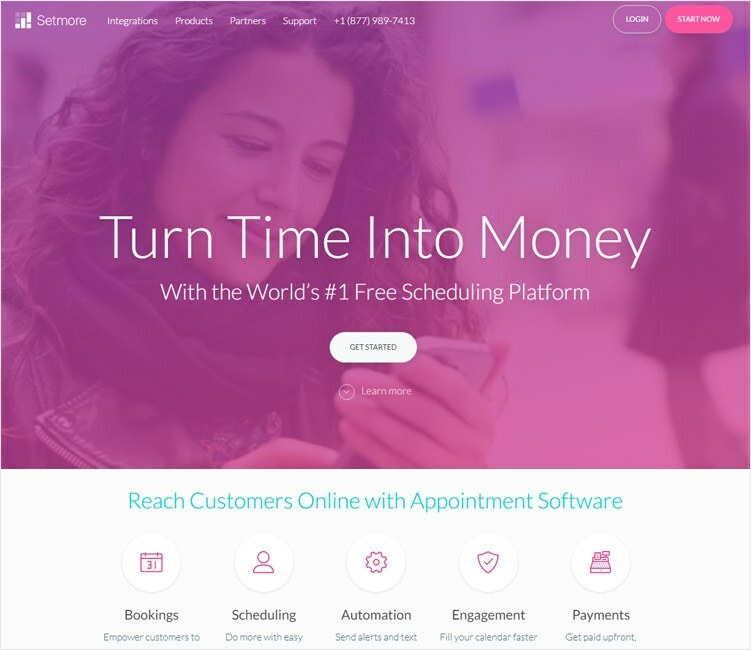 Are you looking for some of the best appointment scheduling software? The appointment is one of the main customer service methods and it is really important to handle all the appointments with same important. Also, there should be a pool of resources and there availability tracking system to accept the customer demands.in this case the requirement of appointment scheduling software come in and the package is coming with some more other fields. 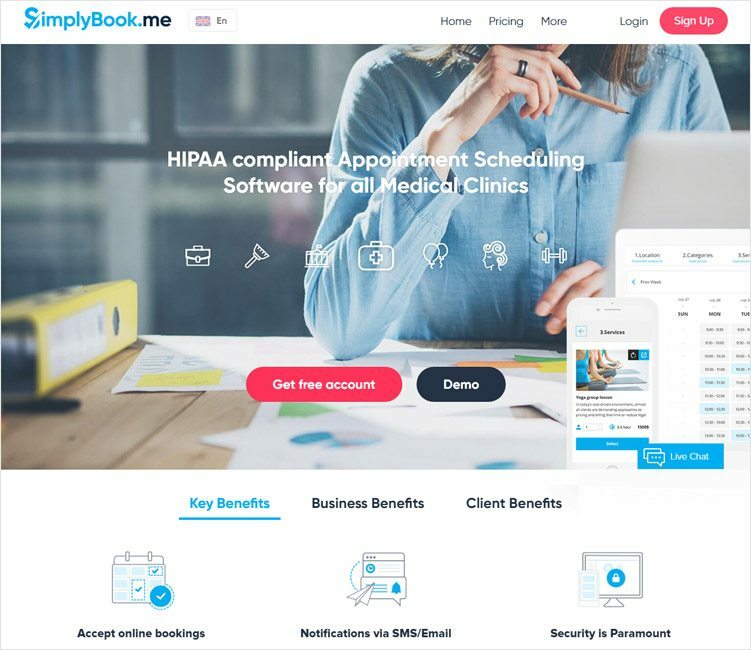 Simple Book is an appointment scheduling system that suitable to use with all type of industries. Following set of key features associated with Simple Book. Facilitate online bookings and appointment and employee schedule will manage according to the received bookings. Mobile compatible scheduling page and scheduling app for easy use. Separate booking widgets for social media and other web sites. Dual way synchronization to google calendar. Corporation specified special enterprise booking system. Apart from the above key features following a set of features associated with Simple Book. Complete company or individual staff scheduling with mechanism to avoid duplicate bookings. Easy to use calendar to create bookings and manage existing bookings. Easy rescheduling and cancelling options. Customizable booking page with possibility to add additional data fields. Visitors counter option and the dashboard with statics, graphs to monitor the operation. Create unlimited services and unlimited service providers. Easy steps to add promotions to improve customer interest. Multiple service categories and the facility use with difference locations. Customizable booking confirmation SMS and Emails. Possibility to add client reviews on booking page. 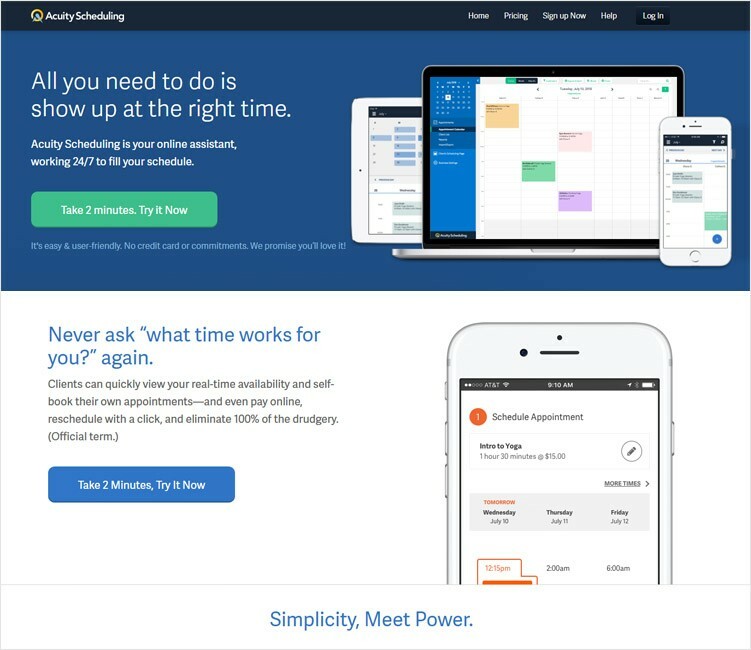 Acuity Scheduling will help your clients to see your actual availability and enter bookings. Also possible to pay in advance. Also, the appointments cancellation is easy. Following set of features associated with Acuity Scheduling. Possibility to do the booking with local time zone and time conversion is internally handled by the application. Customizable appointment intake for allow to add only required fields to make the appointment according to the nature of the business and it reduces booking time from the customer end. Sync with the google calendar and integration with Outlook and iCal. Email and SMS reminders for both parties involved with the appointment. Manage all the staff and locations available for booking in a centralized location. Possible to customize everything associated with the application to make an identity on your business. Payment monitoring option allows checking who has done the payment with the paid amount and who has not paid. Possibility to disable payment option and use only for appointment scheduling. Group scheduling facility for such requirements like workshops. User-friendly simple interfaces for all actions with help. 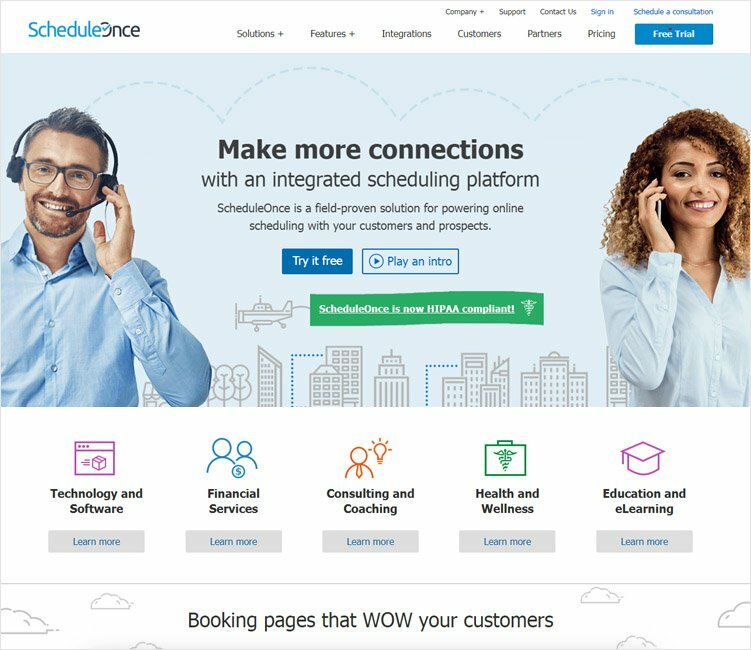 ScheduleOnce is software that facilitates to make an appointment in an efficient way and increase customer satisfaction on the business. Following set of features help to achieve this goal. Automatic booking creation – this feature allows to the customer to select the time and then the booking will create automatically for all relevant parties and calendars. All basic data will consider when creating a booking and no further action required from either party. Booking confirm on approval – When there is an overlap booking system suggest feasible time automatically before confirm the booking. Customization freedom of ScheduleOnce allows adding multiple services to a single booking window. This feature facilitates to model your service in a specific way to the customer. Also, this will help to maximum utilization of team members and equipment. Virtual and physical meeting locations available – Virtual locations for online meetings and physical location to offline meetings in a physical location. Sessions – Session booking allows a customer to make a series of appointments in one booking. Group sessions – Group sessions allow to create several appointments in a single time slot. Resources booking for meeting help to reserve all required participants in advanced and also prevent duplicate booking for any resource. Direct resource scheduling option facilitates to book resources inside or outside of the organization in advanced. 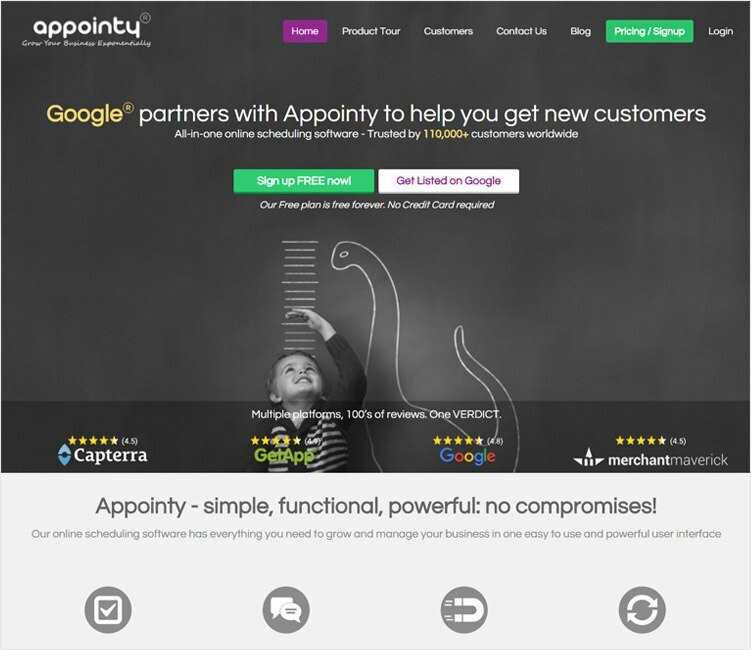 Appointy is a web based scheduling tool that can use to manage client requirement with available resources. Real time scheduling allows to maximum utilization with the following set of features. Management of appointments is the key feature and system will make sure for no duplicate scheduling for a given time period that makes resource overlapping. Attendance of all employee is key information to make appointment per day and system keep in track all available and absences. Create automatic reminders to all the parties involve in both SMS and Email format. Import data from outside systems and also export data related to the scheduled appointments. The system maintains an employee database with all required information and it helps for emergency contacts and instant messaging. All data fields, reports and functionalities are customizable. System facilitate branding of the interface align with the user company. Third-party calendar integration, Client website integration, email integration and mobile access also possible with the system. 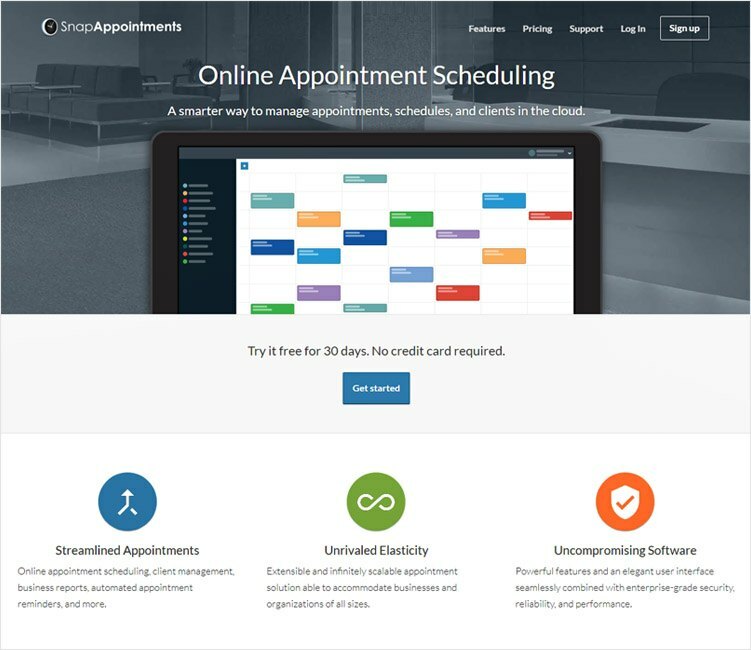 This service is web, Android and iOS compatible online appointment scheduling application that helps create and manage appointments. Setmore is a free application comes with following set of features. Compatible with all mobile platforms and simply download the app and stay connected from anywhere. Cloud-based application allows creating, managing and tracking appointments and keeping control over on anytime from any location. Staff management allows organizing the available staff and increasing productivity. Booking page customer review display option allows you to publish the reviews you received for the service provided. The fully customizable user interface allows adding additional information like company logo, location, opening hours etc. Automatic SMS reminders will prevent the missed appointments and make sure all the requirements are ready to serve the customer. iOS and Android compatible app allows managing appointments from anywhere. All the available time slots are visible to the customer and they can do the booking with few easy clicks. The system allows integrating the appointment calendar with other popular apps. 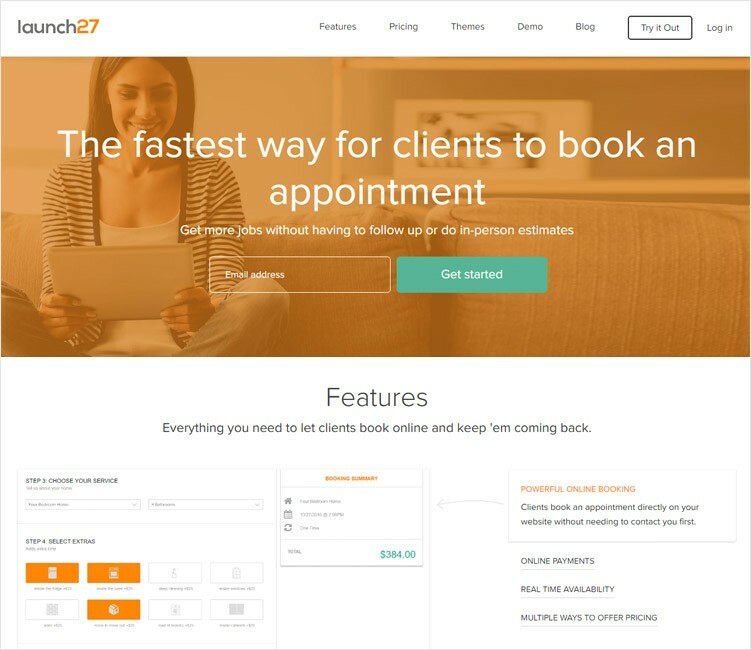 Launch27 is a top rated appointment scheduler and booking software for service sector businesses. Following set of features associated with Launch27 will help to boost your business. Easy installation method to any web page by adding few code lines. Customized layouts according to the font and colour of your business theme. Custom field option and re-arrange facility to the user interface with editable API. The customer can access real-time availability window and can make an appointment without contacting the company. Multi-location booking helps to create different price options for each location and service. Multiple pricing options allow calculating and display a total price for each service depending on the customer selection. The wide range of credit card acceptance option helps to create a payment gateway within your site. 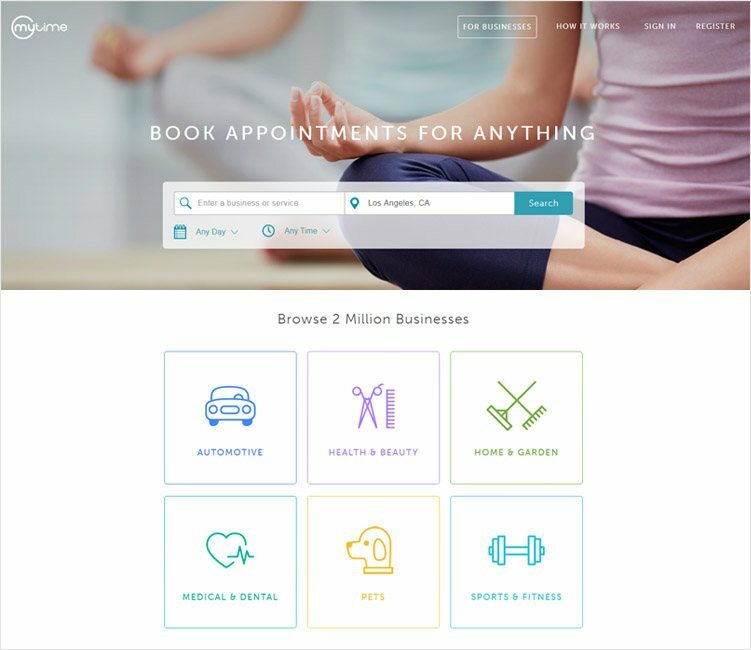 Facility to create recurring appointments by weekly, monthly or yearly. Possibility to add promotional items like gift cards, Discount code and customer referrals. Automatic fully detailed appointment reminders. Drag and drop schedule management facility. Client ratings and feedbacks window. Customize the application on hours of work, services provided, lead time, travel time or availability. 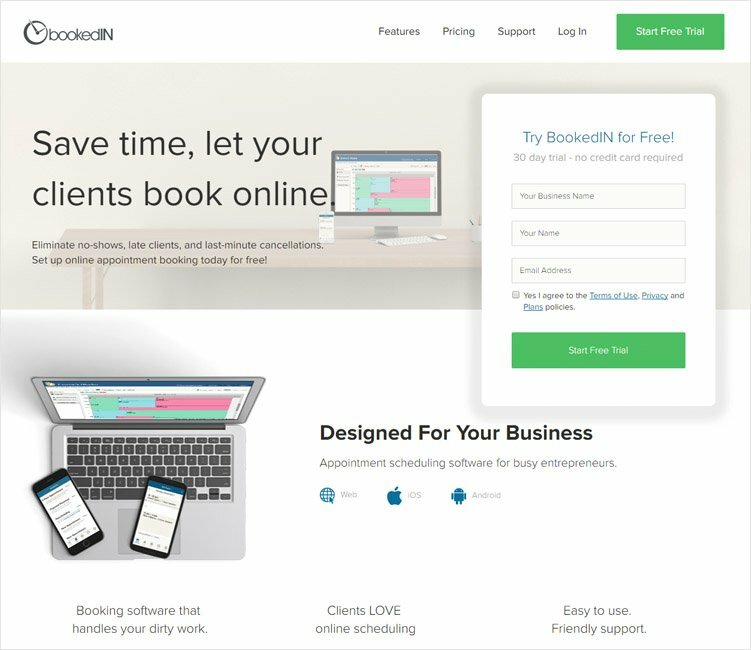 BookedIN comes with 30 days free trial version and the easy setup to start work with following features. Easy booking from the client on 24/7 basis directly from the company Facebook page or BookedIN scheduling page. Add the company Logo/ portfolio photo or Colors. Possibility to add the detailed description of your service to the customer in booking page. Collect customer information from customer intake page and get to know the customer for a long-term business relationship. Possibility to schedule employees, equipment, rooms or anything using multiple calendars. Keep track on booking and payment history in client level details. iPhone or Android device compatible application for make booking real online. Perform all the appointment managing work from your phone. Sync the BookeIN calendar in real time with Google, Outlook.com, iCloud, Office365 or Microsoft Exchange. Possible to embed the booking calendar or a booking button into any web site create from any format. Email reminders on existing bookings and system created alerts on cancellations. Also, all the staff members get to know with a notification when there is a new booking. Online payment gateway comes with credit or debit card payment facility and PayPal payment facility. Also, payment request and receipts can create from the system. Possibility to add discounts and promotional items. Automatic backup procedure and user role definition option provide high-security access and data security. MyTime is an online scheduling and staff management tool that allows the user to streamline the resources of the business. Mobile optimizes booking option or possible to embedded the booking page to your existing web site. SMS appointment confirmation to reduce unauthorized booking and also cancellation policy can customize to charge from the customer for last minute cancels. iPhone/Android compatible application allows you to manage your bookings from anywhere. Promotional items like gift cards and discount packages can easily be associated with the application. Facility to create recurring appointments. Keep track of client information and appointment history. Easily create email campaign from available customer details. Report and business analytic facility allow monitoring the patterns of the business. Automatically track product inventory to keep all required products with minimum inventory level to cater customer requirements. 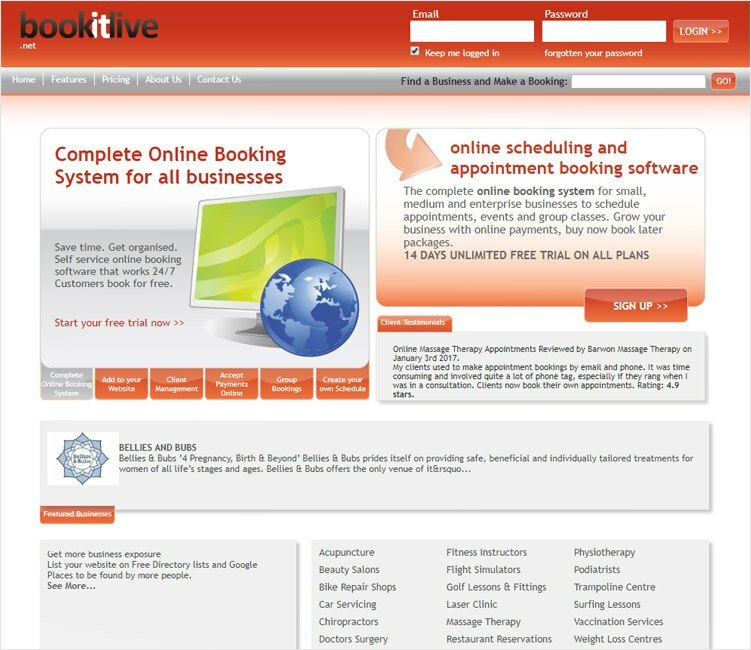 Bookitlive is a complete online appointment booking and scheduling system suitable for all the industries. System is working as a virtual receptionist for the business and assist to business development with following features. Take booking from your web site directly. Special buttons with captions like “Make an appointment”,” Book Now”,” Book an appointment” available to add your web sites. Possible to do the booking through Facebook using widgets. Automatically collect client details when doing the bookings and those records can use separately. Also, import and export client detail facility is available. Newsletter sending functionality to the existing customers in the database. Email and SMS customer communication facility. Booking possibility to 24/7 basis and also possible to control outside of working hours bookings. Free web directly listing and free promotion on Facebook/twitter pages. Group booking facility with defines the maximum number of participants and facility to create predefined timetable. Customizable with brand logo and colours to make your identity with the application. Mobile device compatible tool that allows you to accept, Manage and create booking from anywhere. SnapAppointments cater to a wide range of business from small scale to large scale service businesses with safety, privacy and security. Following features associated with SnapAppointments. Each staff member can define as a user with special permission set and roles. Real-time availability calendar is visible to the client when creating appointments. Business related reports on appointment from client and staff assignment related reports. Email, SMS or phone call reminders for the appointments can configure with the system. Option to pay for the appointment when create booking using credit cards. Appointment calendar can sync with many more calendars like outlook calendar, Google calendar, Apple calendar, etc. Appointment Booking Widgets allows doing the booking without leaving from the site. When considering all 10 most popular appointment scheduling software available in the market there are set of common features can identify. Also, most of them provide the free trial period to analyse the features of the system and identify the good fit software according to the business is going to handle with it. All the systems focus to keep eye on each individual appointment and check the feasibility to cater to the request before confirming it to the customer. Also, the possibility to customize according to the company standards makes unique feeling to the customer.